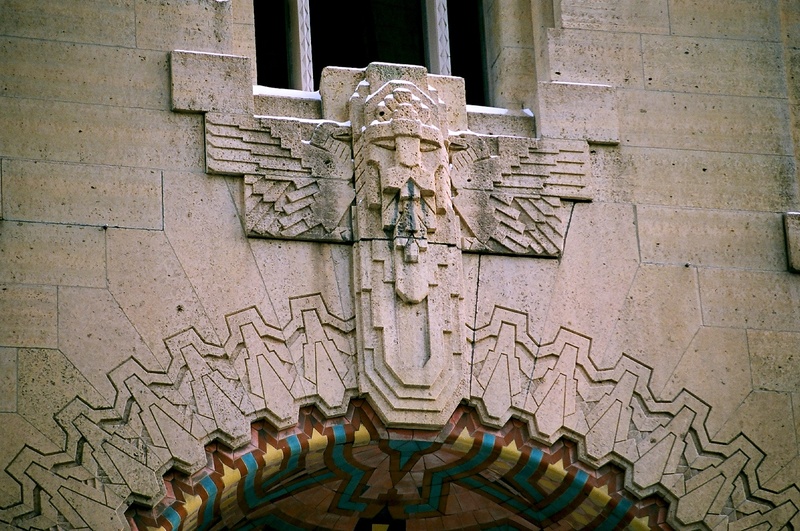 Wirt C. Rowland considered himself a modernist, although he was fascinated with Gothic style of architecture, as well as material associated with the Arts and Crafts movement. 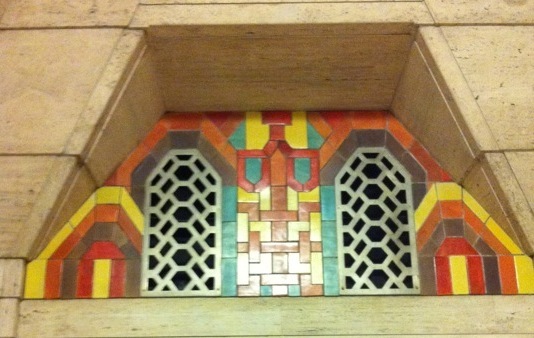 You can clearly see this in almost all of Rowland’s projects and especially here in the Guardian Building. 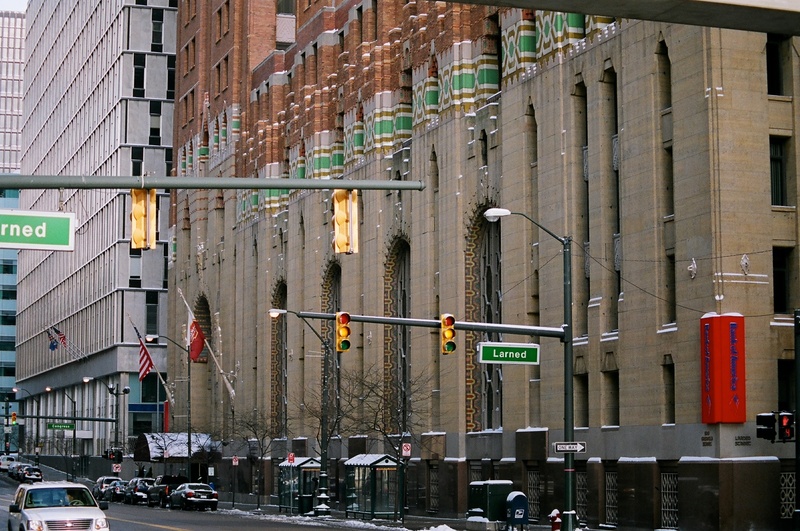 The orange colored brick and the shape of the north tower can be seen as far as eight mile road heading south on Woodward Avenue. There are actually four tile companies that did the work for this project – there was simply too much work for one pottery to handle. 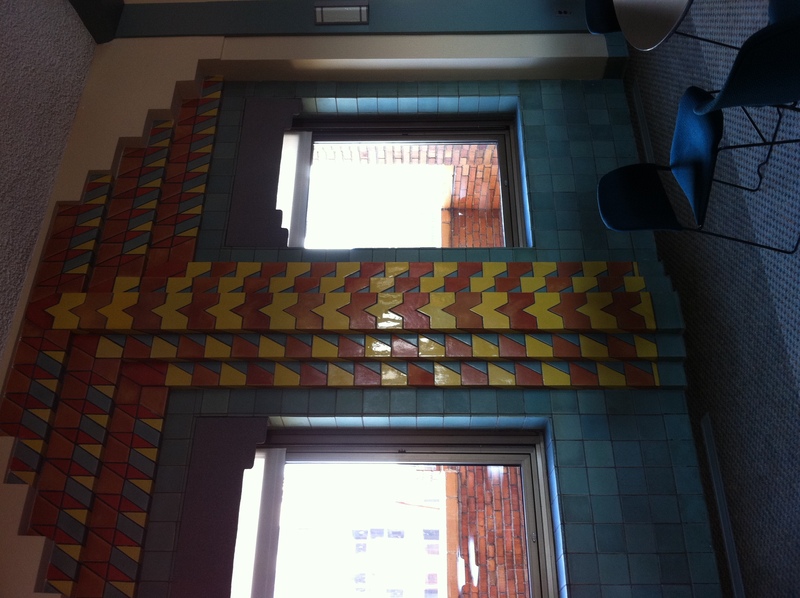 We’ve looked at the Pewabic entry and Rookwood lobby. Additionally, Rowland choose Flint Faience and The Atlantic Terra Cotta Company. 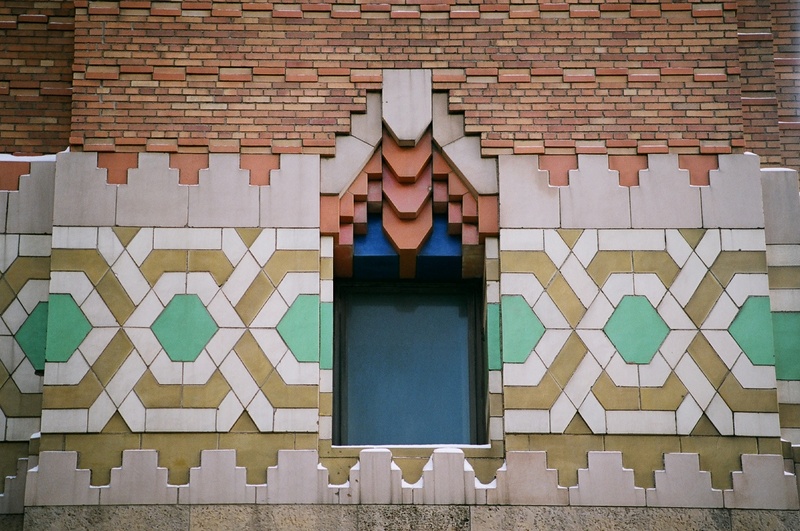 The Atlantic Terra Cotta Company (originally A. Hall & Sons Terra Cotta founded in 1846) was able to handle the exceptionally large pieces for the exterior in green, white, black and gold. This terra cotta powerhouse located in Perth Amboy, New Jersey was able to execute large quantities and large scaled projects. 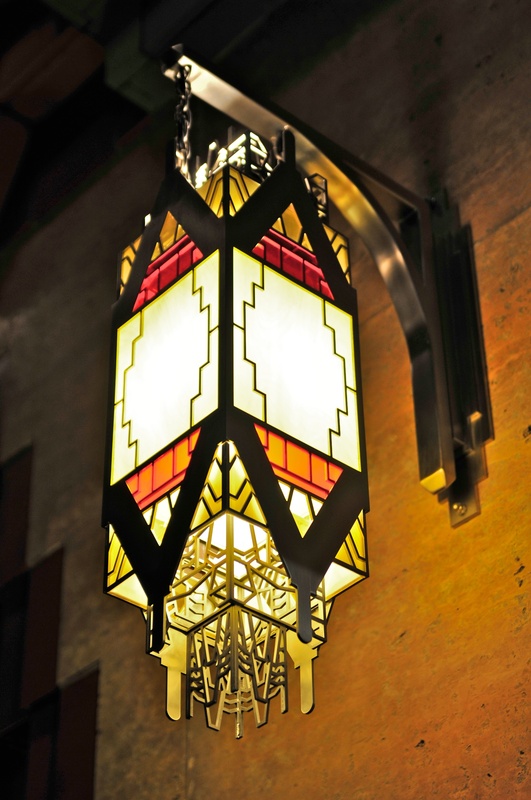 The Flint Faience Tile Company was founded in 1921 as a division of AC Spark Plug. 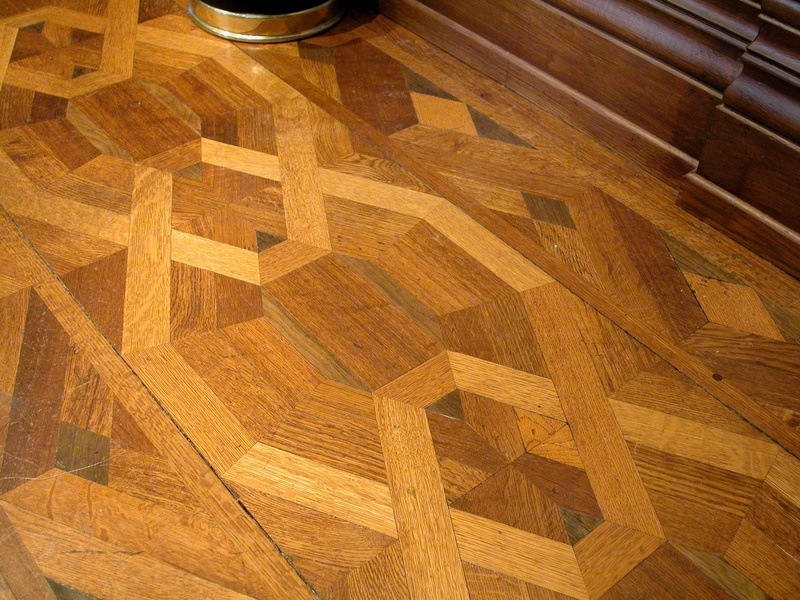 There are several area where their tile can be found. 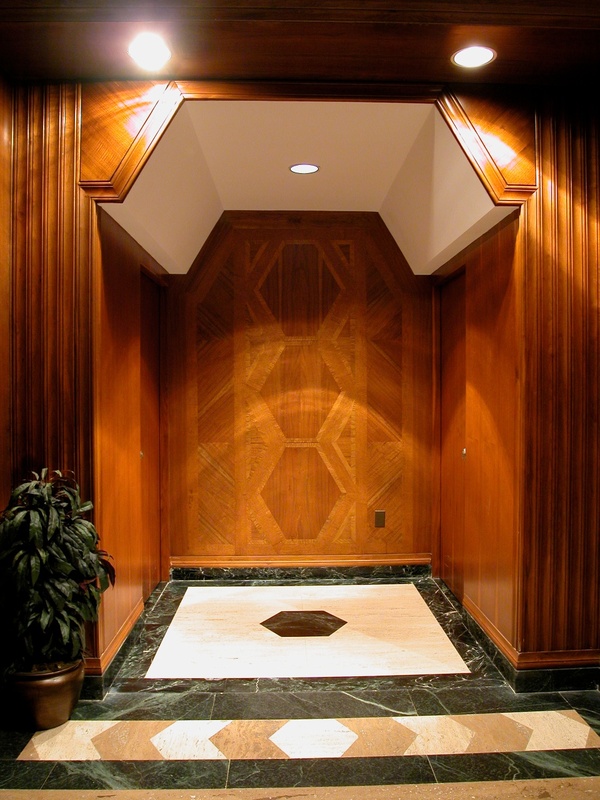 First, in the tympanums in hall to the lower banking room, and the other is the 32nd floor dining room. 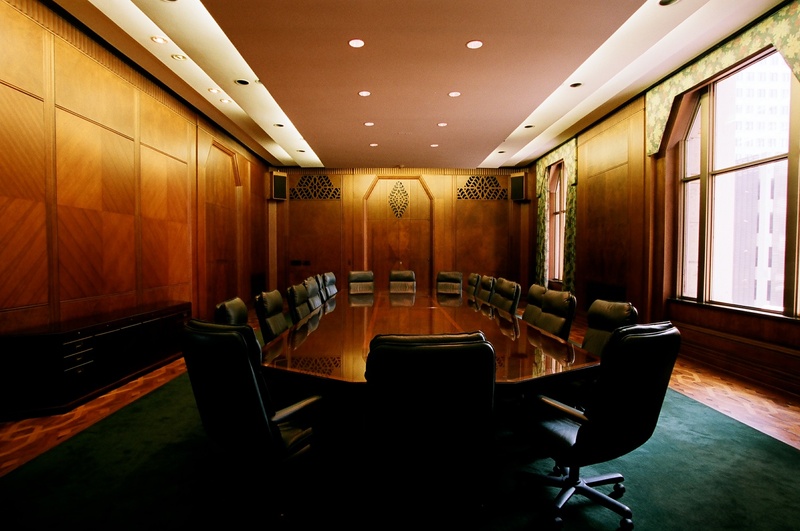 The board room is located on the 6th floor and of course is just as spectacular as the rest of the building. Here Rowland choose the Moline Furniture Works to fabricate the cabinetry and marquetry made from his sketches of mirrored veneer patterns – again, we see the similarities of the 30 / 60 / 90 degree motif. In the banking room is a beautifully painted ceiling set with jewels of amber Czech glass lights. The ceiling holds a secret: horsehair. The horse hair was used for two purposes: one, it provided great acoustics so that your banking concerns could be quietly discussed with tellers, and second, it provided a better surface for the decorative paint of Thomas DiLorenzo in gold and silver leaf. 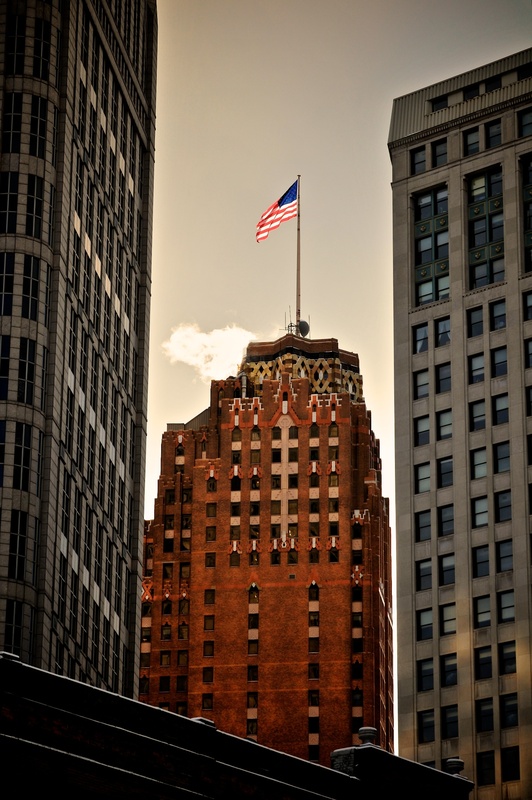 After a receivership in 1933, the Guardian Building bounced around to a few owners when in 1951 a group formed the Guardian Building Company and began “modernizing” the building. I won’t go into detail of exactly what “modernizations” where made, but let me just say that we need to give a HUGE round of applause to Steve Ewing, the President / COO of then MichCon (Michigan Consolidated Gas Company) who was so very instrumental in restoring the building to its original grandeur. 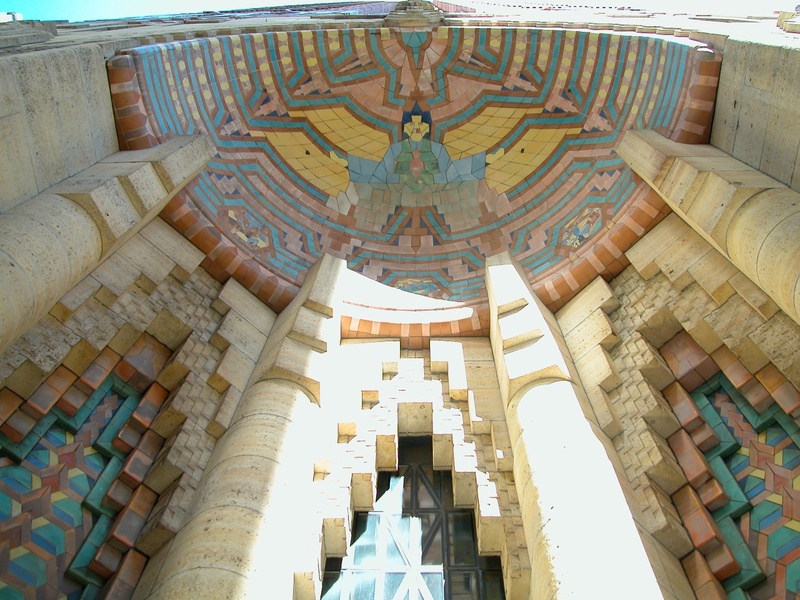 The Guardian Building would not be what it is today if it weren’t for him. It is now protected on the National Register of Historic Places. I recently had the opportunity to speak with Steve Ewing about the Guardian, and he shared with me a very beautiful story: after the Guardian restoration was complete, he invited DiLorenzo to view the building again and his son brought him to view the building. When the wheelchair bound DiLorenzo saw the ceiling which he painted, he had tears of joy streaming down his face. 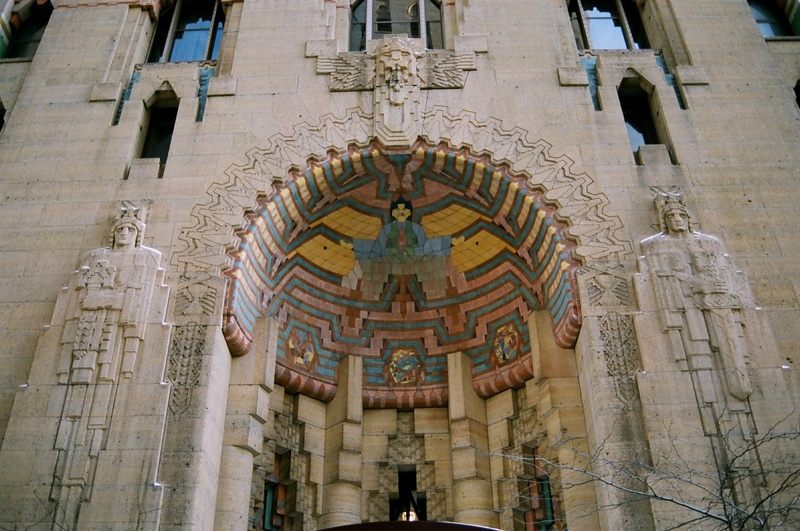 Rowland created the Guardian Building to be bold and massive in terms of color and design, saying that this is what design called for in the age of the automobile, delicate details would be lost by the automobile whizzing by. 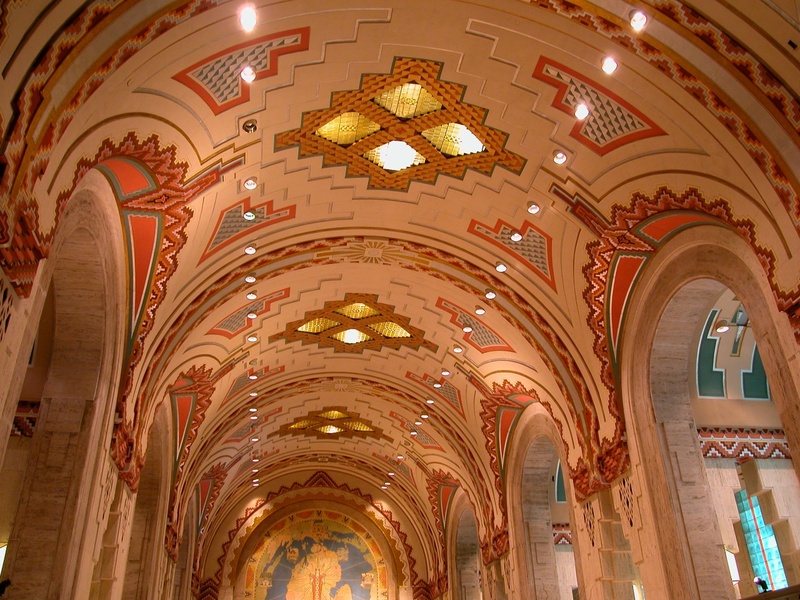 The lobby is five stories, vaulted ceiling of polychrome tile in an interpreted notch arch design from the Rookwood Tile Company in Ohio. The notched arch appears in a myriad of sizes, materials, and textures as you can see in the black Belgian Veinless marble on the floor. Another fantastic marble used in the lobby and staircase to the banking room, is the Numidian marble. Because the color was non-existent at the time, Rowland traveled to Africa to open a mine which had been closed for decades. The Monel Metal screen which divides the banking room (now the retail promenade) features a clock made of Favrile glass from the Tiffany Studios in New York. It’s stylized numbers are concurrent with the notched arch design. 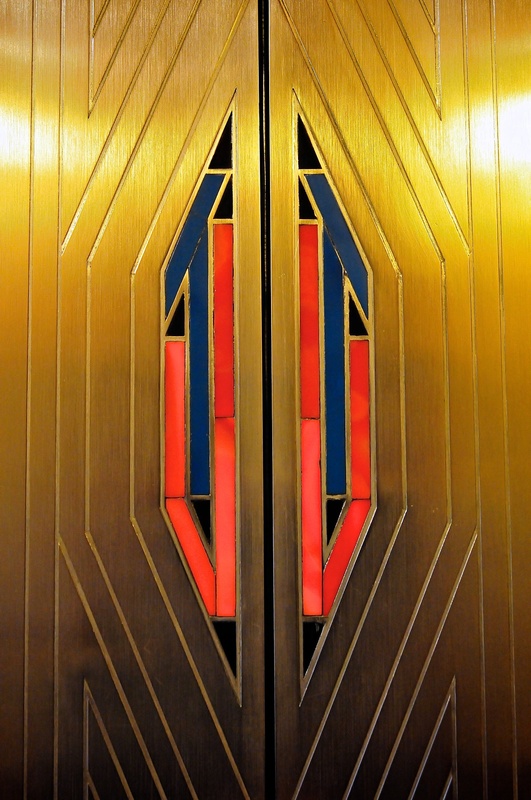 Over 40,000 pounds of Monel Metal was used on the lift doors, the screen that separated the banking room (now retail promenade) to the main lobby, the teller windows, handrails, switch plates, waste bins, banking desks, mailboxes, directories, vault gates, lamp stands and inkwells – only to name a few! A combination of nickel and copper, it’s properties did not allow for casting – it could only be rolled and cut. The hallway to the lifts. 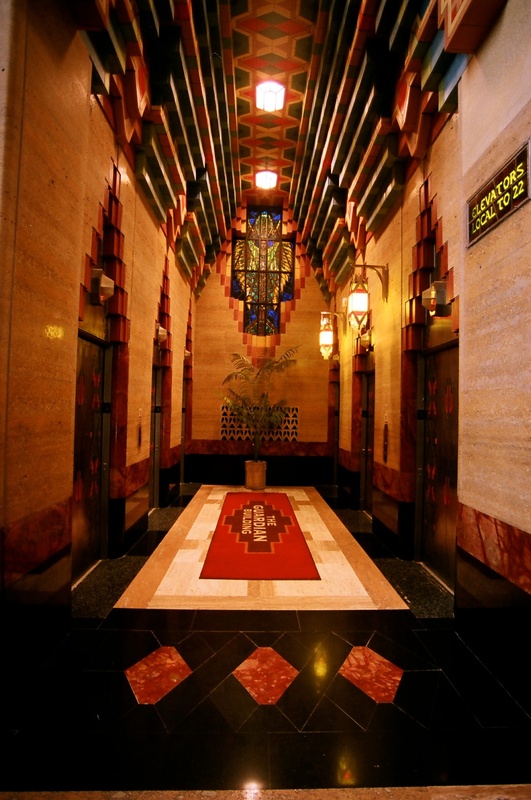 Notice the notched arch design from above the lifts, the marble near the rug, and even the ceiling. 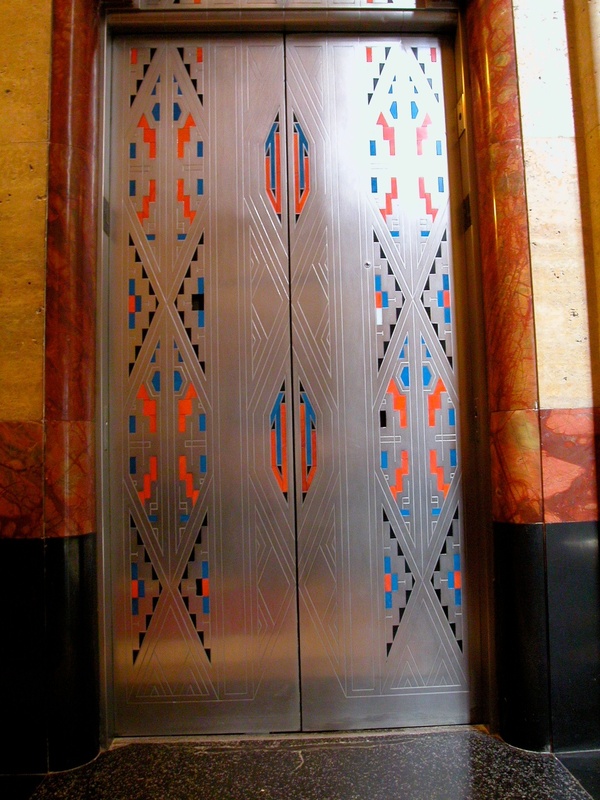 The lift doors were created by the Dalstrom Metallic Door Company. 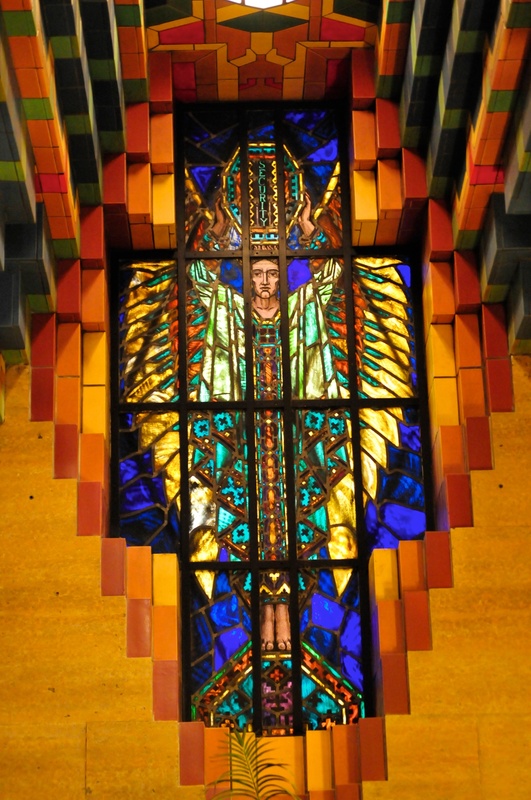 At the end of the hall, are colorful stained glass windows of rolled and painted glass made by George Green from Shields, Pennsylvania. 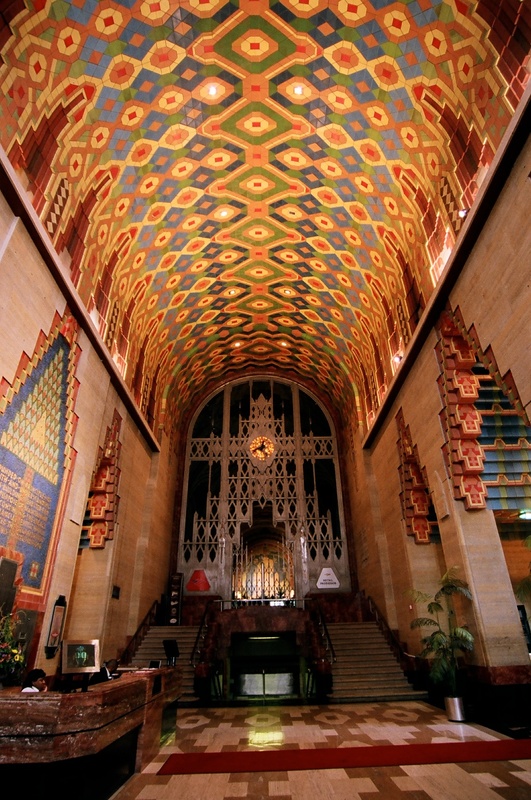 Union Trust Building which we now know simply as the Guardian Building, was completed in March of 1929. 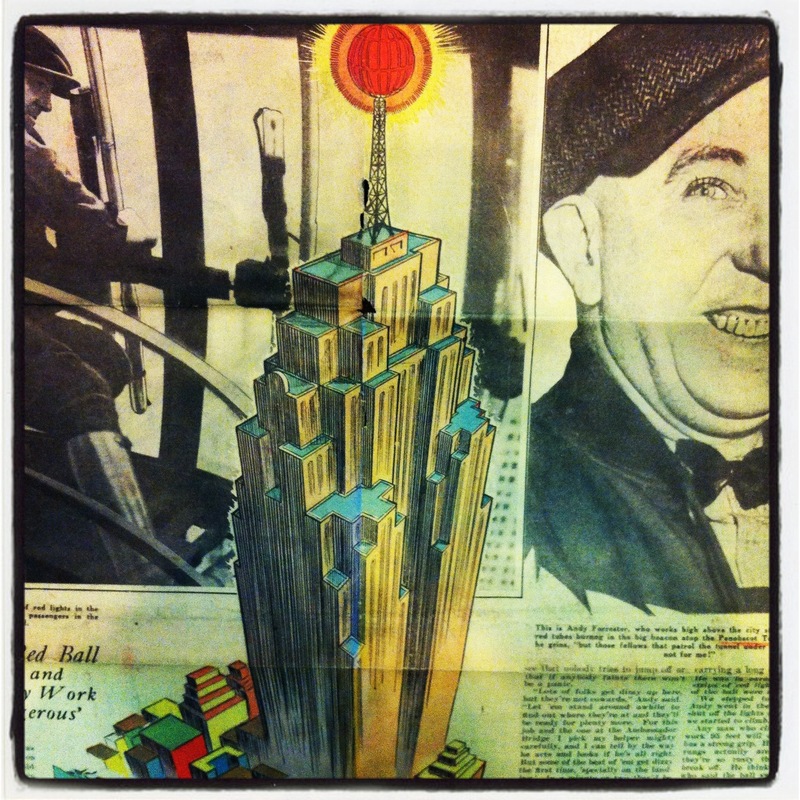 When the building opened, all three major papers ran special commemorative sections. This was the second building built for the Union Trust – the first was a Beaux-Arts structure built in 1896 by Donaldson & Meier where the Chase Tower stands today. Mary Chase Perry Stratton developed her glazes based on Rowland’s pencil sketches and above the main entry Stratton designed a figure with outstretched arms as a symbol of progress and prosperity. Flanking her semi-dome, Corrado Parducci modeled the multistoried figures guarding the entrance. Safety, holding the sword and Security, holding the key are massive yet the figures almost go un-noticed as they are literally projected from the buff colored Mankato stone. 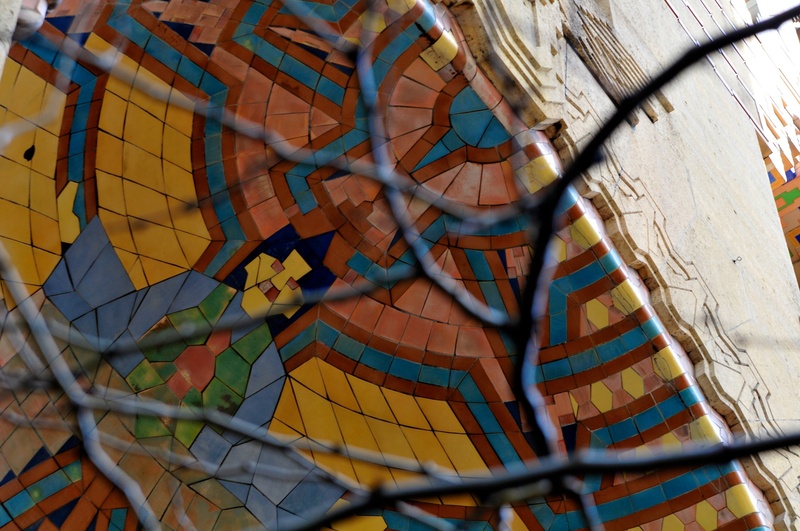 Another of Parducci's exterior details. Notice the "wings" are actually stylized eagles. Stay tuned… tomorrow we head to the interior! The Penobscot Building in the financial district is one of the most prominent buildings that has shaped our city’s skyline. 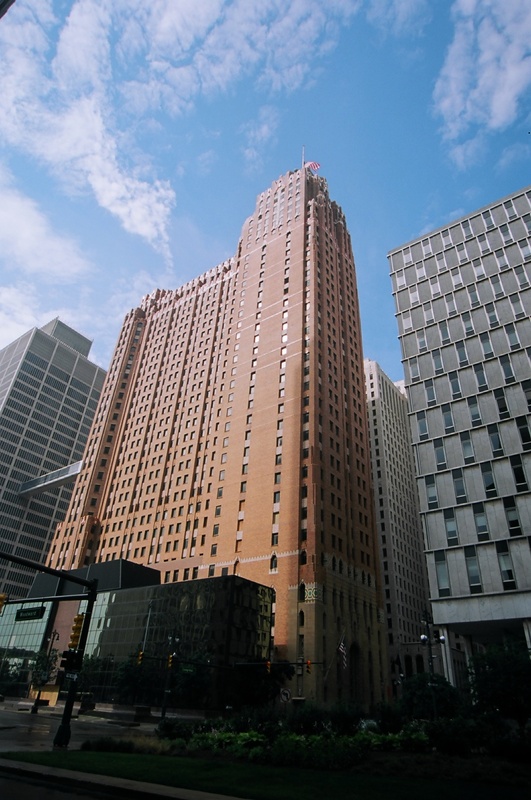 The second to be built of the Rowland “big three” is actually the third of the Penobscot Buildings – the first two of the cluster were built by Donaldson and Meier. Donaldson and Meier were in line to build the third building, however, the owner decided to go with a modern style and chose Wirt Rowland of Smith, Hynchman and Grylls (now the Smith Group). The Donaldson and Meier proposal looked very similar to their David Stott Building, just north on Griswold. I recently found this Free Press article from 1932, and thought the color illustration was such a great graphic, I had to share it here. More on the Penobscot to follow!